I've always wanted to participate in a challenge where one of my friends is in the Design Team. All About me is a great blog. I have to admit that I'm a lurker, I check the blog as much as I can, sometimes I post in their Message Board. "My Mark" is the most recent challenge. For this layout I felt like making the title in Spanish, but I journaled in English (sorry for the mistakes). Here is my layout: "Los lunares en mi cara" "The moles on my face"
I really enjoyed making this page; thanks to the DT for the great inspiration. 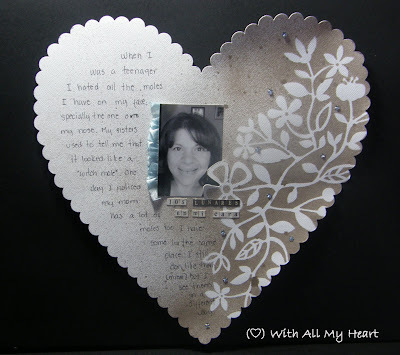 fabulous masking and i sooo love the heart design. thanks for playing along with us over at aam!!! Awesome job on the masking! Great project! Beautiful layout, I just love it! !